Good Buys come and go, and yesterdays good buys often become tomorrow’s not-so-bargain-basement acquisitions. As in real estate, where land prices of suburbs surrounding more desirable suburbs eventually succumb to market pressure from those buyers whose budgets do not extend to the premium-priced real estate, vintage Omega Constellations attract a similar phenomenon. For example, because the price of a really good quality stainless steel pie pan model 168.005 has now broken through the premium barrier, there has been strong upward pressure on prices of the ’cheaper’ calibre 561/564 models and integrated bracelet calibre 751 versions. The next ‘suburbs’ away from the C-Case and Integrated collections are Constellations powered by the calibre 1011/1021 fast beat series. Thanks to the rehabilitation of the reputation of the calibre 1011/1021 series, the general consensus now is that well-preserved examples of this series are worth collecting. As long as you source a watch that has not been neglected, frankened or overly refurbished, you can reasonably assume that, with regular service, it will serve you well and increase in collectability. So what 1011/1021 models are the best of the good buys? I would like to nominate the “TV” dialed stainless steel 368.0852 (stamped 168.059 on the inner case back) as an excellent candidate for a good value entry-level vintage Constellation. Described in Omega literature as the “rounded square” dialed integrated bracelet models, a 368.0852 in good condition can be purchased for $300 - $400, the price at which C-Shapes with brickwork bracelets commanded a couple of years ago. The rounded-square dial in the stainless steel version reflected the trend away from circular dials. A brushed silver dial surface echoed the case finish and the armoured hesalite crystal was flush with the case, creating the illusion of dial and case being of one piece. Faceted markers with large black onyx inserts offered good contrast, and stick hands paid homage to minimalist tastes of the time. Various dial designs were available, but my favourite is the design that does not have the minute index. Overall, the 368.0852 is a little less chunky than its predecessors. It has a nice, uncluttered design story, and at 33mm by 39.5mm makes an excellent bracelet watch. The 18 karat gold version below showcases its clean lines and understated elegance. In sourcing an example of this model, there are a few checks that you would be well-advised to make. Firstly, ensure that the movement is a chronometer rated calibre 1011. This can be confirmed by examination of the decal on the train bridge (shown below) which will have printed around the perimeter "Adjusted to five positions and temperature". Secondly, the case is a key-bolt compressor type where case body and case back are secured with four screws. Some dealers are loathe to open the case back because they don't know how, but its very important that you have large clear pictures of both the case back and movement so you can check identification marks and the condition of the movement. Thirdly, inspect the movement for tell-tale wear on the rotor (the copper/beryllium coating may be worn after coming into contact with the case back). Look for consistency of colour in the coating, check for scratches and damage on the rotor and bridges, and look for overly burred screws and for rust on case clamps and the steel components of the movement. You can afford to be discriminating when evaluating these models because tens of thousands were produced and thus you can exercise patience until a good example surfaces. Fourthly, the numbers stamped on the inner case back will read 168.059 and not the model number 368.0852. This check is important to ensure than a calibre 1011 has not been placed into a 168.057 case that looks identical (reflecting a somewhat common practice of substituting the discredited calibre 1001 with its successor). Finally, look carefully at the finish of the case and ensure you hold out for an example that has its original brushed finish, as why would you want anything less than original when there are so many of these watches around? Over time, I've seen these models priced in 'Buy It Now' listings on electronic auction sites from $200 to a very fanciful $950. Expect to pay from between $300 to $400 for an example in good condition. At that price you're getting a hell of a lot of watch for your money. I don't know if I'm looking under the wrong searches to get myself a TV Connie between $300 & $400. Seemed a great price for a bloke on average income. Looks like all the dealers and sellers have read your Connie "next best buy tip" for 2012 and bumped up the price to $1K plus. That could be true with dealers Andy, but on eBay auctions the market will decide eh? 1k is well overpriced and if you're prepared to wait to see what comes along on eBay, you may just snag a good example for under 500. I've collected 4 of these rounded square integrated bracelet models since the start of this year, Desmond. Thank you for having such a strong resource, opinion and expertise on-line, because it certainly helped me make confident decisions around my collection. I am now commissioning a collectors case and wonder if you know of plans being available with the exact dimensions of the 368.0852 watch-case? There is a thought that the collectors case might be designed in the rounded square shape to reflect the content and it would be great for the cabinet maker to work from omega specs to find the ratios. Excellent Mark - sounds like you've got a good collection there. I dont know of any plans but I guess the best way to get the dimensions is to push the watch head into a plasticene mold? this site where the process is logged by the cabinet maker involved. We would both appreciate any comments and suggestions from you and other collectors as it moves forward. thanks for the link. Love the idea of shaping the case to look like the watch head. Its a great project and the first drawing really captured my imagination. Good luck, and perhaps when the box is complete we can feature it on this blog. Your blog is excellent, thanks for it. 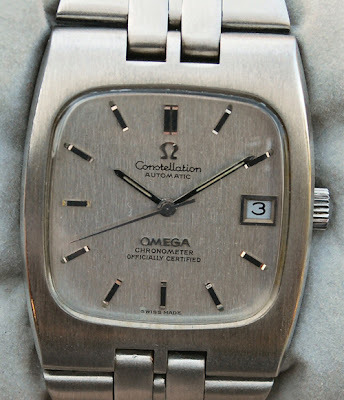 In late-1973 or early-1974 I purchased a new SS Omega Constellation automatic officially certified chronomter (with the rounded-square dial); in case it matters, I purchased it in Vancouver, Canada. Unfortunately, I lost the watch a few years later; I don't know what it Calibre # was. Here's my question: the watch came without the second/minute marks between the 5-minute marks. 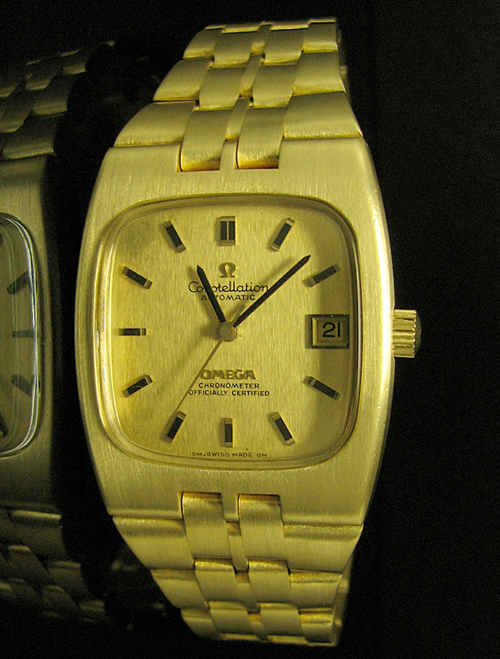 In late-1974 the automatic winding mechanism seemed not to work and I had it repaired a certified Omega repair shop in Canada. At my request, the repair shop installed a new face, one that included the second/minute marks. - Do you know what the Calibre numbers are for the watches that came standard with the second/minute tick marks? - Is it possible that various Calibres (starting with 751) could have come from the factory with the second/minute tick marks? A bit of a conundrum, but I'll try to answer your question. A purchase in 73-74 probably means production in 72 or 73, so if the watch you bought was date only and had a TV dial, that rules out a cal 751. If the Constellation was a day-date watch with TV dial, then it was probably a cal 1021. That is, assuming the calibre isnt a 1001, which only sold for a period of time before being replaced by the 1011. No cal 751 Constellation had a TV dialled case and so we can rule out 751 completely. Hope that helps. If you need further info, try and source a pic that looked exactly like your watch and send it to me by clicking on the email tab in the About Me section. Cabinet maker, Daniel Tomlinson has been putting together a prototype before committing to the final materials and to get the hang of how to create the unique shape. He has the shape nailed so to speak Mark. Cant wait to see the finished product. Perhaps you can send me some pics when the job is done and I can post them here. I recently acquired a gold capped pie-pan conn (19407904/cal. 561) from a watch fair here in London, and having run out of cash also saw a 'TV' black dial 1973 with box and papers (29032207/ST3680847) in great condition. I subsequently took his details and have recently arranged to meet next week to do the deal: £500. I thought that i'd ask your opinion on the value of the watch, since my understanding is that the black dial would increase it's premium? Also, not wanting to take up too much of your time, I came across a stainless steel 'day-date' in superb condition: cal 751, 28016691 from a reputable jewellers (you identified a previous purchase for me) for £400. Your opinion would be most welcome, particularly which one you thought would be the most collectable! With box and papers 500 pounds seems around ball park. Check the black dial to make sure it's original and not a redial. I think 600 USD ( these watches have become more popular) is a good price to pay for an example without box and papers. Really like this blog! Have a question. Bought a watch that was supposed to have a cal.1012, but opened it, and it had a cal.1011. I've since bought a cal.1012 movement, and am now thinking of what I should do with the cal.1011. It's in good condition, but maybe it would be too difficult making a project out of it and buy original parts and put a watch together? Was the watch a 368.0852 or another? Most certified chronometer Constellations were powered by cal 1011 or 1021. Some non-chronometer models were powered by cal 1012, and will not have the "officially Certified, Chronometer" script on the dial (there are one or two exceptions). So I would sort out the above issue before deciding to place the 1011 in another case. Often cases and indeed dials crop up on eBay and places and at one stage watchco Australia had some cases that housed 1011s. Hello Desmond! Thank you so much for taking the time to answer my question. I bought an Omega SHOM 200, put together supposedly by NOS omega parts, probably a watchco version. But when opened, it had a cal.1011. I believe the Omega SHOM 200 weren't ever assembled using a cal.1011? I was researching on the cal.1011 when I came across your site. Now I'm intrigued! Should I look at making a project out of this cal.1011? Unless you think it belongs in the SHOM I bought. I'm relatively new at this... Thanks! Aha, a watchco SHOM. To my knowledge right-hand crown SHOMs were indeed powered by a 1012. If the SHOM is a long-term watch for you, it may be worthwhile considering the 1011 as a parts watch for the 1012. Most parts are interchangeable except the 'signature cal 1011 bridge'. Another option would be to, as you say, make a project out of the cal 1011. Any case that takes any member of the 10xx series will accept a cal 1011. However, the thing to remember is that both watches will always be 'frankens' or to put nicely 'wedding' watches. Yes, HE, I guess these things are personal choices. Cal 1011 and 1012 are identical movements, both 23 jewels, and the principle difference in the cal 1011 is original parts selection from the parts bin (top quality, no flaws) and some degree of adjustment (although much less than earlier chronometers) along with chronometer certification. 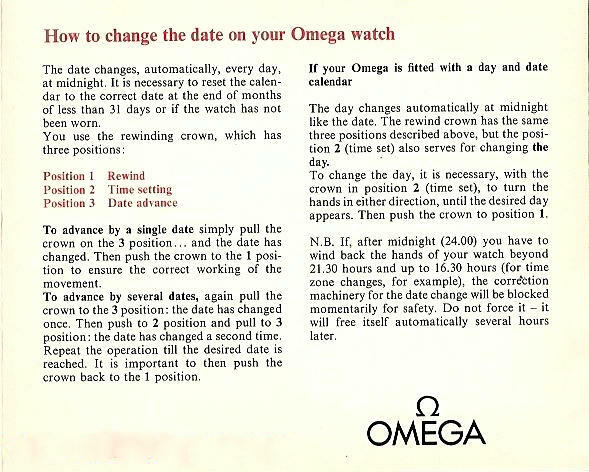 I received an Omega Constellation Automatic Chronometer cal 1011 watch that I was told was made in the 1960s. I'm under the impression it's an original but I noticed that on the watch it says "Chronometre" as opposed to "Chronometer". All of the Omega models I've seen online say "Chronometer". Does this mean it's a fake or are some models spelled differently? Thank you! Generally by the 1960s most Omega Constellations were styled Chronometer. However some French cased Constellations in solid gold powered by cal 1011 still had the "Chronometre" lettering. This practice continued up until the abandonment of the gold standardard in the early 70s. If in doubt, send me a pic through "view My Profile"
Generally, two or three links near the clasp can be removed. A quick trip to the mall and a watch service outlet is advised and the links can be quickly removed. If you have a tool that allows the link pins to be removed then you can of course do it yourself.